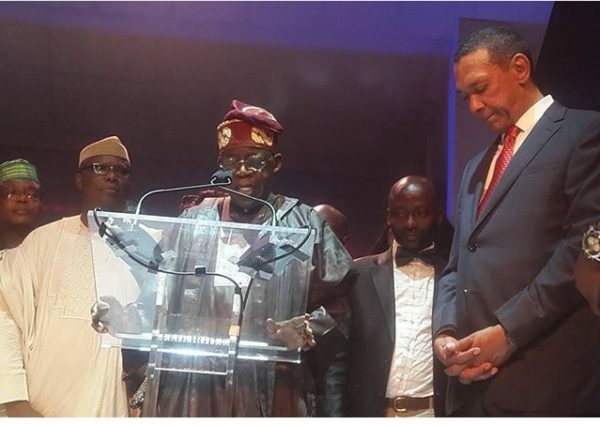 The National Leader of the ruling All Progressives Congress APC, Asiwaju Bola Tinubu, despite the differences in ideology have been honoured by Senator Ben Bruce’s Silverbird Group. Tinubu, was yesterday awarded the Silverbird Extraordinary Man of The Year in Lagos. Recall that Ben Bruce, a senator representing Bayelsa State is the owner of Silverbird Group and a key stakeholder in the opposition party – People’s Democratic Party PDP. Tinubu, while receiving his Silverbird Extraordinary Man of the Year Awards on Sunday night said that a Nation cannot achieve progress, unless its leaders plan meticulously for it in a continuous way. He stated that plans for the country’s development must be made, regardless of partisan politics. “We must also be committed to that plan to drive success and development, and that is what we must do together as a nation. “But you as Nigerians, you must persevere, endure and have the pain now in order to have a better tomorrow. “Let’s turn our challenge of today to prosperity of the future; we can achieve it, ” he said. Tinubu called on senators to sponsor and push a bill to reinstate history in schools as a way of passing down the culture and history of the nation . “Laws that would be productive and useful for the development of the country should be made” he said. Tinubu further stated that moving from analogue to digitalisation to protect the history and records of the country and generations to come, is not a bad idea . “As information technology is improving everyday, we can digitalise Nigeria where the country’s archives or history is preserved. “It is also a way to eradicate piracy in our country, ” he added. While delivering is speech Sen. Ben Murray-Bruce said that 10 per cent of the budget should be allocated to preserve the history and culture of the country. “As a nation, we have to pay attention to who we are, where we are coming from, and where we are. “We need to start teaching history in Nigeria because we cannot develop or grow as a country without the concept of history,” he said.